I've been otherwise engaged for a while, (summer holidays and change of school for Beth), but Mike's most recent blog, and the response he has had to it, has stirred me into action. When Mike first mentioned to me, that he'd been coming across more and more people who had not been taught the relationship between what they inject and what they eat, I really believed that there must be a medical reason, some sort of logic wherein that extra bit of effort was now, thankfully, no longer necessary. Our instinct is to trust our doctors. I said,"But surely they get refered to a dietician." And Mike said, "They do, but they don't all do carb counting." So what do they do? Presumably say, stay off the sweets, eat a low fat high fibre diet. I want to scream. This diabetic business is a scary one. It is scary for Mike and it is scary for me, Ellen and Beth. It is scary for Mike's Mum and Dad and everyone who supports us. Ignorance makes it even scarier. When incidents like the one which made us begin this blog occur, we need to know why. We need to know what caused it, is it likely to happen again, and what to do if it does, we would like to be prepared. 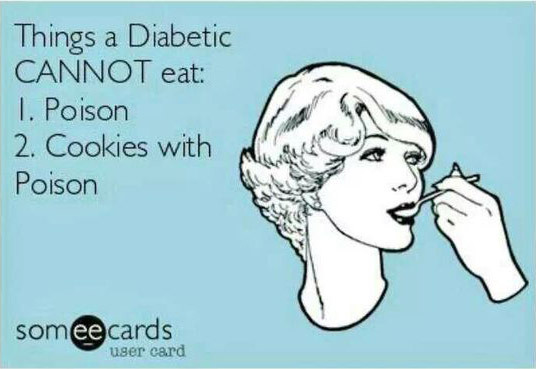 With diabetes, ignorance is not bliss. Mike read a blog recently, where the writer refered to his immediate family as type 3's. He quite liked that description, though I think of us more as diabetic once removed. We need including in the education that has to happen. Not every diabetic that goes to see a dietician cooks at home, there is often someone else doing that job. I remember very early in our relationship, Mike showing me a glucose injection, and saying that if his blood sugar went really low I may need to use it. He said, "Practise on a grapefruit." I probably looked quite calm and said ok at the time, but it terrified me, and I remember thinking 'I'll just call 999.' I guess as a parent with a child with diabetes, you get some sort of training, but being diagnosed as an adult leaves you very much alone. The important thing is to know how much carbohydrate is in your meal, we aim for 60grams, because it's easier for me to know what to aim for, and easier for Mike to know automatically what's likely to be in his meal without having to ask every time. It could be whatever suits your appetite I suppose, and can vary from meal to meal. Half of a deep pan pizza, three quarters of a thin based pizza. Naan breads vary, but often around 70gr carbohydrate each. Actually all of these things vary, and you have to check the packs, but we find it useful to have a rough idea. Potatoes are the hardest thing to estimate, we were initially told that a potato the size of an egg is approximately 10gr of carbs. That's useful for roasties, but useless for mash, and new potatoes are an entirely different problem. It's experience that helps with things like that. You also have to take into account flour added, tinned tomatoes in a sauce adds a small amount, pulses add quite a lot, root veg if that is a large part of your meal can change the calculation, and of course look at the information of any jar or packet that adds to the meal. If you're cooking for one, the job is then done, if you're cooking for a family, it's only just begun. You have to work out how much of what you've just measured out carefully, needs to be dished up for the diabetic in the house, to ensure that he/she is getting approximately 60gr of carbohydrate on his/her plate. Bear in mind not everyone around the table will have the same size appetite. Again, it's actually pretty easy with experience, but mind boggling to begin with. I cook pretty much everything from scratch, but it is probably easier to make those calculations if you eat mostly from packets, which is ironic. It can still be healthy if you add lots of fresh veg, which mostly doesn't count at all. Mike can eat strawberries and melon without extra insulin, but all other fruit, including fruit juice, he has to allow for. Mike mentioned the other day that when he first was diagnosed, he wondered whether he was allowed to replace sugar with honey. All sweet things have their price, we know that now, so we rarely eat puds, but allow ourselves a treat now and then. If it's shop bought Mike goes by the info on the pack, and invariably gets it about right. If I make a pie I use eating apples rather than cookers, so that I don't need to add sugar, if we're being good; but to be honest, so long as it's a treat and not the norm, it's nice to spoil ourselves now and again, and it's enjoyed all the more for it's rarity. A good diabetic cook book helped me to get the hang of things, I had a small book produced by Sainsbury's, which was simple and clear with pictures, (a must for any cook book) not too many recipes to get overwhelmed by, just a few which looked appetising and manageable for a weekly supper. The same one is no longer available, but there must be similar things around. I have an overwhelming desire to put my arm around anyone just starting out and say, 'It's going to be fine, you do get used to it, I'll show you what to do.' I suppose that, ultimately, is what we hope happens to anyone who is first diagnosed. Not counting - the cost. 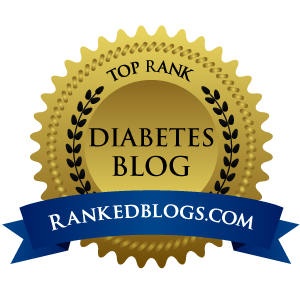 An open letter to Diabetes UK. 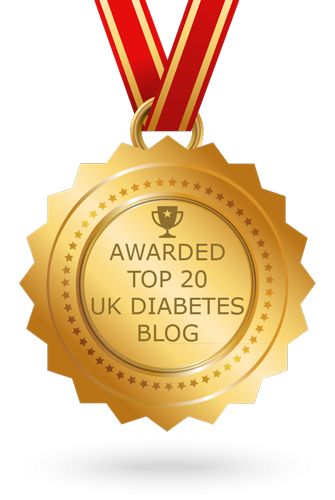 I was diagnosed with type 1 Diabetes in 1991 and joined the then British Diabetic Association almost immediately. Over the years I have come to value the support, research-funding, campaigning and much of the information that the organisation provides. However I am writing this letter because I feel there is a significant and quite dangerous problem with the advice being given to newly diagnosed type 1 and newly insulin-using type 2 diabetics in the UK. I am appealing to Diabetes UK to work with the NHS and healthcare professionals to implement new guidelines which provide essential information to new insulin users. The problem is this: People are being prescribed basal-bolus insulin regimes without sufficient information about carbohydrate counting. The problem does not appear to be universal. Some HCPs still do things the 'old way' and provide information about measuring the quantity of carbohydrate to match insulin doses but in a few weeks' research I have come across dozens of people, diagnosed over the last 10 or 15 years who were told little or nothing about the relationship between carbohydrate and insulin when they started a basal-bolus regime. Some patients have muddled through, working things out for themselves, others have sought help and advice from peers or online forums. Even more worryingly, some patients report that they have asked their clinic or surgery for more detailed information only to be told that, "We don't offer carb counting here...". This is insane. This is quite frankly, not good enough. People are being instructed on what doses of insulin to take, and only being told to eat a diet which is low in fat, high in fibre and contains 'some' starchy carbohydrate at every meal. When you inject a bolus dose of rapid-acting insulin the clock begins to tick. If you have not eaten enough carbohydrate within something like 30-60 minutes then your blood glucose level will begin to fall. If your level was within guidelines before the meal then the risk of hypoglycaemia becomes almost a certainty. On the other hand, of course, if your meal contains too much carbohydrate then your blood glucose level will rise steeply above and beyond the recommended limits putting you at greater risk of developing diabetic complications. However, and this is the nub of the problem, 'not enough' and 'too much' become meaningless if the diabetic has never been instructed to measure the amount of carbohydrate they are eating. The problems are all too real, and the solution all too simple. Every diabetic put on basal-bolus MDI (multiple daily injections) therapy must be given instruction on estimating, measuring and monitoring the amount of carbohydrate in their diet. Mr X, a newly diagnosed type 1 diabetic is told to administer 5 units of rapid-acting insulin to cover his evening meal and to eat low fat, high fibre diet which includes starchy carbohydrate. On Monday he has gammon, vegetables and new potatoes. On Tuesday he has soup and a wholewheat roll. Wednesday's meal is a wholewheat pasta bake. His meals, while in line with his dietary guidelines, contain approximately 50g, 35g and 70g of carbohydrate respectively, and yet he takes the same 5 units of insulin each time. One evening he is fine, another he goes hypo, another he ends up high. In 6 weeks he sees his DSN (diabetes specialist nurse) who tells him that his HbA1c is worryingly high and that he is having too many hypos. 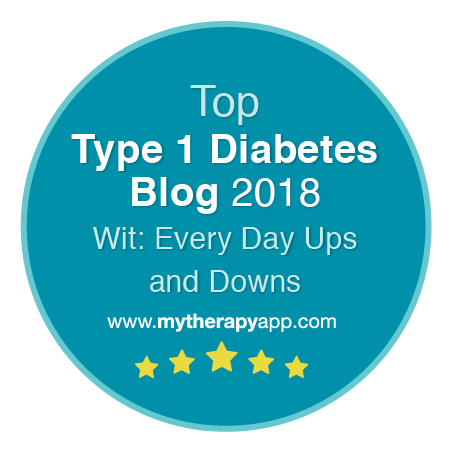 If his DSN looks at his blood glucose diary there will be a scattered pattern of highs and lows because, though the insulin doses are fixed, the carbs being eaten vary significantly and are not being measured or monitored. The amount of carbohydrate Mr X needs to match his fixed doses may be different to Mr Y. It may change over time, or if Mr X is more or less active than usual. But unless he is monitoring what he eats, he and his DSN will have no information on which to base informed changes to his regimen. Some diabetics for whom 'MDI has failed' are put on insulin pump therapy. At which point they are automatically given instruction on carbohydrate counting, and rightly so. For many this is a lightbulb moment. But in all honesty there is little real difference in a 5 unit bolus given by pump and another by injection. Both will require a measured response in terms of carbohydrate eaten to avoid hypo- or hyperglycaemia. I have no idea why it was thought better to give people less information to help them manage their diabetes. If you go back 15 years or so it seems everyone on insulin was taught the importance of counting carbs. When I was told by my own DSN that "we don't really do exchanges any more" I wondered what had replaced it. It horrifies me to think that what replaced a simple understandable framework was, in some cases, nothing. This can only have lead to poorer control, worsening HbA1c results and, by extension, more hospitalisations due to hypoglycaemia and a higher likelihood of patients developing costly (in all senses of the word) diabetic complications. To advise people to take insulin without educating them about measuring the carbohydrate they need to eat in response is madness bordering on the negligent. I urge Diabetes UK to work with the NHS and the government to ensure that every diabetic treated with insulin is given a simple framework of education, perhaps as little as a 10 minute consultation, that will help them understand the fundamental relationship between insulin doses, grams of carbohydrate and blood glucose levels. Update: If you reading this post has made you interested in carb counting yourself and your care team do not offer it, you might want to look at the Bournemouth (BDEC) online carb-counting course.